Educating the younger generations in the spirit of respect for the human rights and fundamental freedoms, dignity and tolerance, and free exchange of opinions is a goal that is at the basis of a partnership between the Romanian Institute for Human Rights and the Ministry of National Education that is substantiated in the form of traditional by now activities: the national school contests the “Civic Education and Civic Culture Olympics” and “Democracy and Tolerance” as well as the “Contest on didactic creativeness in achieving auxiliary material to be used with human rights education”. The Contest is addressed to students with skills in the field of socio-human sciences, focusing on education for familiarization with and application of the fundamental values of human rights, for behaviours that respect these essential rights, and competencies for participation in the public life. With the civic education section, students are organized in teams of two 3rd or 4th grade students, while with the civic culture section they are organized in teams of 7th and 8th grade students of the same school unit. The Contest is a complex form of civic education that involves students in primary and secondary schools. The students are organized into three-member teams, one of which is a primary school student. 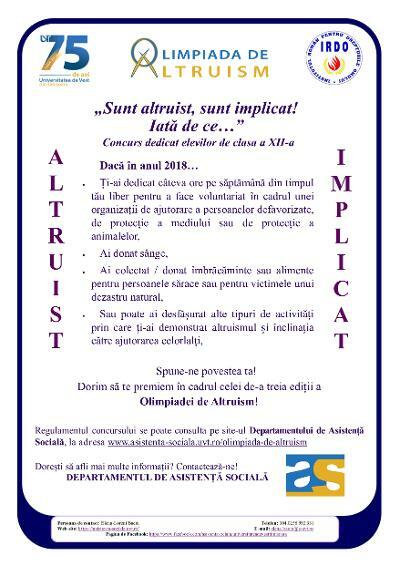 The Social Assistance Department of the Faculty of Sociology and Psychology of the West University of Timisoara, in partnership with the Romanian Institute for Human Rights, launched the contest called "The Olympics of Altruism". In order to promote and reward pro-active behaviors and values of co-operation and support in the community, the contest is addressed to students of the 12th grade from any of the Romanian educational institutions accredited by the Ministry of National Education, which contribute to the development of an inclusive society. Students will submit for the contest a document (text, collage, photo, video) that tells the story of a volunteer activity they have undertaken. 10 May 2019 - Announcement of results; the papers will be evaluated by a jury made up of teachers from the Social Assistance Department and social work practitioners. Held in the period 30 October – 10 November, the contest was addressed to children between 12-14 years of age. For several rights laid down in the Convention on the Rights of the Child and displayed by the Contest Poster, the children were supposed to write down at least three responsibilities they had in their relations with friends, colleagues, the family, school and the community. The contest, organized to celebrate the International Children’s Day, focused on children’s rights. Evaluation and awarding were provided by the Institute. The drawing contest, involving 17 children, was an opportunity for the participants to use their colours, gift and imagination to illustrate a large range of rights (to a healthy environment, to national identity, to play, to education and to protection). The three winners were awarded prizes consisting of books. Two contests organized on occasion of the Global Education Week in the period 18-26 November 2017. The literary creation contest was entitled “Words and attitudes for a happy childhood”, while the plastic creation one was entitled “The face and colours of childhood”. The awarding ceremony took place on 10 December. Organized at Secondary School “Mihai Viteazul” in Pucioasa, the contest focused on “tolerance” and addressed students in both primary and secondary educational cycles. In the 80 posters they achieved, the children used their imagination and colours to express the concept of “tolerance” both as a defining value of human personality and perceived in a broader meaning as the capacity to accept, to understand and to interact with people around, irrespective of nationality, skin colour, ethnicity, language, religion, culture, etc. The eight winners of the contest (Bănescu Daria, VIII-C, Mituţă Daria, IV-B; Butcă Andreea, V-C; Mărculescu Teodora / Toma Ştefania, VII-B; Ioniţă Elena, VIII-B; Pântea Alexia / Nechita Ioana, VII-C; Măntescu Bianca, V-A; Negoiţescu Arina / Poşchină Andreea, VIII-A) were awarded by the Romanian Institute for Human Rights on the International Day for Tolerance, 16 November 2018. The awards consisted in encyclopaedias and books produced by “Corint” and “Epica” publishing houses, based on the partnership concluded between the latter and RIHR. On occasion of the Universal Children’s Day (20 November), the Romanian Institute for Human Rights, in partnership with Secondary School No. 117, organized a plastic creativity contest entitled “Children’s rights as seen by children themselves”. The drawings, creative and original, approached several types of rights: to family, to health, to information, to education, to protection against violence, etc. Some students even included written messages on their drawings: “Children’s rights should be respected”, “People have the same rights, but different preferences”, “Certain rights are violated”. The winning drawings are going to be included in a thematic exhibition devoted to Human Rights Day (10 December), alongside with drawings achieved by other children from Bucharest and other locations in the country. Article 29 of the United Nations Convention on the Rights of the Child provides that the educational process shall be directed to “the development of respect for the child’s parents, his or her own cultural identity, language and values, for the national values of the country in which the child is living, the country from which he or she may originate, and for civilizations different from his or her own”. Bearing in mind these desiderata and given the celebration of the National Culture Day in January, the Romanian Institute for Human Rights, together with its partners – Editorial Group “Corint” and the Museum of Bucharest Municipality – are going to bring to the attention of children and teenagers the emblematic figures of the Romanian culture by means of a contest of mini-essays. The contest takes place between 20 November – 20 December 2018, while ten of the participants will be awarded packs of books offered by Editorial Group “Corint” and a visit to the Museum, in the framework of a festivity organized on 15 January at the Museum of Bucharest Municipality – Şuţu Palace. The mini-essays, entitled “Why do I like…” (name of the chosen personality or historical figure) shall be sent to the e-mail address office@irdo.ro and motivate in half-up-to-one page pages the choice in the title. May you be inspired and good luck! More details here (ro) and here (ro). Essay Contest "Democracy and Tolerance"
At the proposal of the Romanian Institute for Human Rights, the essay contest took place at the Gymnasium School 113 on the occasion of the International Tolerance Day. Participating students have approached in their essays the theme of tolerance in the context of human values ​​from their own perspective. They have written about accepting diversity, understanding other people without prejudices on grounds of race, color, nationality, ethnicity, religious convictions, customs or traditions. They shared their experiences and facts of life. The jury of the contest took into account the personal touch , writing skills and the ability to have an overview of the phenomenon of intolerance and of the consequences it may have on society. The Romanian Institute for Human Rights awarded the winning essays; the prizes consisting in diplomas and publications, the Universal Declaration of Human Rights, illustrated for children and translated into Romanian. All the participants received RIHR publications on human rights. On this occasion, RIHR has concluded a partnership with the Gymnasium School 113, Bucharest.